Tutor Basis of LUA programming. The Host-API (API for Application Programming Interface) Demoniak3D/LUA is the whole of the functions which allow a script written in the LUA scripting language to interact with Demoniak3D. Fig. 1 - Host-API LUA. 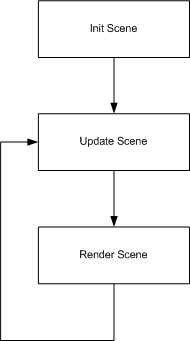 Demoniak3D uses the script node (XML element) to integrate some LUA scripting code in the 3d scenes. LUA code can be written either in LUA files (* lua), or directly within the raw_data element of the script node. The initialization stage is performed only once, just after loading all the medias that are necessary to the 3d scene (models, textures...). The update stage, like the rendering stage, is continuously (infinitely) performed several tens of time per second. The model of figure 2 is not specific to Demoniak3D, it is that used by the majority of the video games. A simple operating model but of a formidable effectiveness! initialization scripts: these scripts are runt ONLY ONCE in the scene initialization stage. These scripts are generally used to initialize the data (global variables). They have an operating mode (run_mode) called EXECUTE_ONCE. update scripts: these scripts are run before each scene rendering. These scripts contain all the logic of your demonstration, the updates of the 3d objects position, physics handling, AI (Artificial Intelligence), audios tracks. The run_mode of these scripts is EXECUTE_EACH_FRAME. XML and LUA initialization scripts describe the state of the scene at time t zero. All these scripts define the initial conditions of the scene. update scripts describe the state of the scene at a time t higher than zero. LUA updates scripts are not necessary to all the scenes. For simple scenes, the initial conditions are sufficient to create a dynamic scene (see for example the auto_spin attribute of some objects such as the 3d models). management of the properties common to all 3d objects: HYP_Object library. management of 3d meshes and models: HYP_Model and HYP_Mesh libraries. management of cameras: HYP_Camera library. management of lights: HYP_Light library. management of materials: HYP_Material library. management of textures: HYP_Texture library. management of user input: HYP_Input library. management of audio tracks: HYP_Sound library. For a complete and detailed description, please refer to the Reference Guide provided with Demoniak3D. Now that we have the bases of LUA and the Host-API, let us analyse a concrete example. We will use for that the code sample 41. 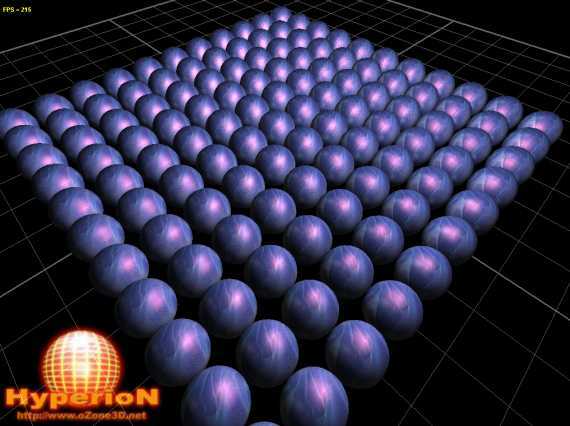 This example shows how to generate a matrix of spheres. The matrix needing to be created only once, its creation will be done in a LUA script whose run_mode is set to EXECUTE_ONCE. The second LUA script will make it possible to drive an omni type dynamic light around the matrix. The position of the light having to be updated with each frame, this script will have a run_mode set to EXECUTE_EACH_FRAME. 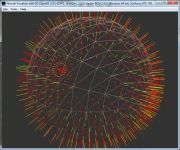 The goal of this script is to clone 100 times a mesh sphere (called master_sphere and declared in the main XML script) and to position each clone in order to form the matrix of figure 3. This script is directly written within the XML code by using the raw_data element. In LUA coding, a 3d entity can be identified either by a string character (in general the name given in the XML script with the name attribute) or by an integer number. Most of the functions of the various libraries host-api accept these two ways to identify a 3D entity. In the previous code, the HYP_Object.Clone() function returns a numerical identifyer of the new cloned object which will be used in the next functions. Page generated in 0.0032169818878174 seconds.